If those Air Miles from Shop The Block are burning a hole in your pocket, it might be worth waiting a few more weeks to redeem them. 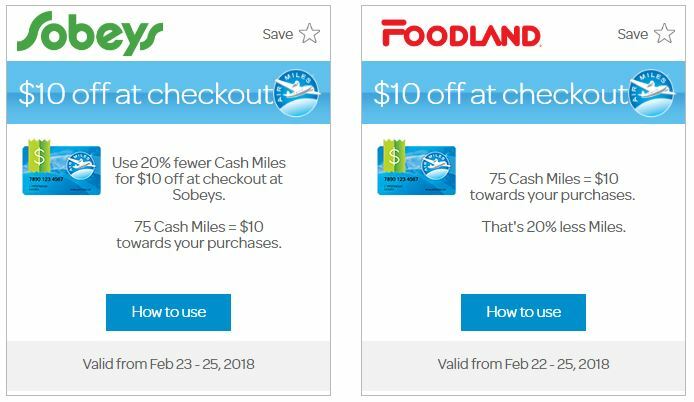 In two weeks, you will be able to redeem just 75 Air Miles for $10 at Sobeys including Sobeys Urban Fresh and Foodland stores in Ontario. That is a savings of 20 Air Miles per redemption giving you a lot more for your points. This deal is available from Thursday 22nd February to Sunday 25th February and you can redeem more than $10 at the reduced rate. While the usual points back promotion of 25 Air Miles is a better deal, it is nice not to have to wait 60 days for them to credit with this offer. Don’t forget that starting next week, the flyers for Foodland will shift to Thursday starting dates to bring them in line with other stores. You will still earn points on items bought when redeeming. So before you shop, log in to Get My Offers with your Air Miles card to get store offers valid at either store. Check back here for flyers closer to the promotion.